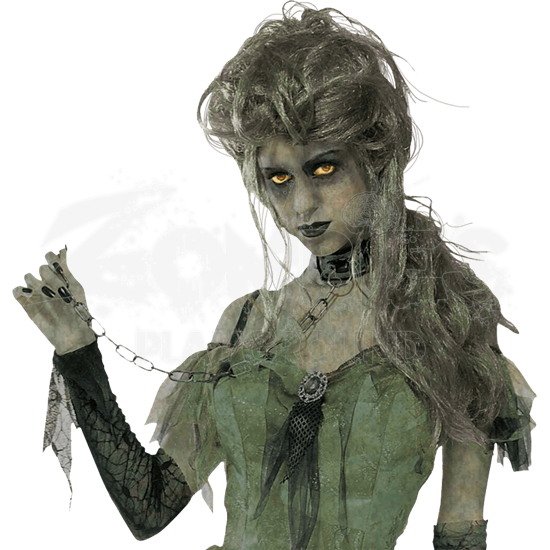 You will be the epitome of deathly beauty, as well as the envy of all your ghoul-friends when you wear the Zombie Lady Wig. This accessory features the unkempt style that suits zombies so well, while retaining a dark beauty as well. This pretty wig is made up of synthetic hair that is colored primarily an unearthly green color, with strands of black and silver hair shot throughout to give the wig a multi-colored, yet deathly look that is appropriate for zombies. It is styled into a mass of curly locks on top of the head before cascading down the back in a style that is both ghoulish and elegant. The wig features an elasticized cap for a snug, comfortable fit. The overall length of the wig is approximately 20 inches. If you are looking to create a different sort of zombie, one that is not all blood, guts, and horror, but rather one that can retain a look of deathly beauty, then perhaps the Zombie Lady Wig is an accessory for you. Instead of looking like you just rolled out of your grave, you will look like you are waking from the most beautifying dirt-nap you have ever taken.